Nice Vue UI Toolkits on GitHub. Hi. In this article, we'll see nice UI toolkits for Vue. If you're ready, let's start. The first one will be Element. I think Element has nice components. I created a project as an example. Browser Support: Modern browsers and Internet Explorer 10+. The second one will be iView. Actually, I didn't use it on any project. Because of it a little bit slow. Just my opinion. Build amazing applications with the power of Vue and Material Design and a massive library of beautifully crafted components. 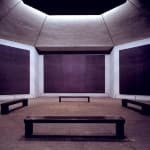 Created according to Google's Material Design Spec, Vuetify components feature an easy-to-remember semantic design that shifts remembering complex classes and markup, to type-as-you speak properties that have simple and clear names. Vuetify supports all modern browsers, including IE11 and Safari 9+ (using polyfills). From mobile to laptop to desktop, you can rest assured that your application will work as expected. Interested in the bleeding edge? Try the vue-cli Webpack SSR (Server side rendered) template and build websites optimized for SEO. This one will be Buefy. Lightweight UI components for Vue.js based on Bulma. We used Buefy many times in our company projects. Recent versions of Firefox, Chrome, Edge, Opera, and Safari. IE10+ is only partially supported. 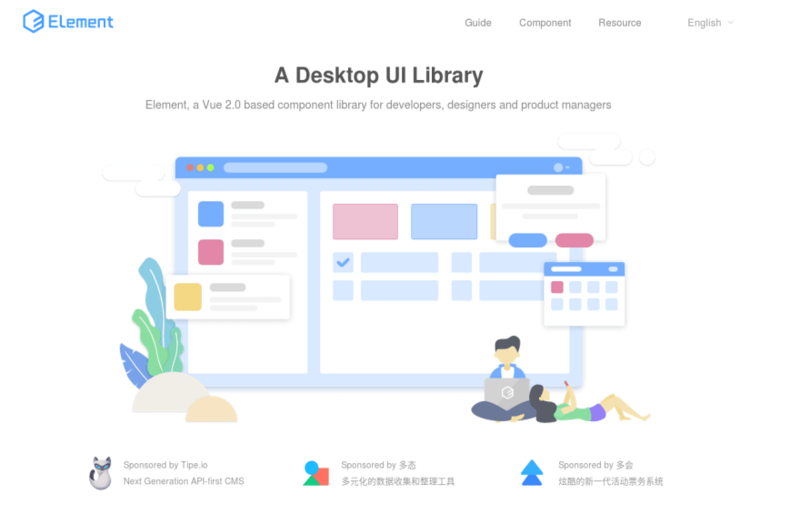 Following the Ant Design specification, we developed a Vue UI library antd that contains a set of high-quality components and demos for building rich, interactive user interfaces. The above imports Antd entirely. Note that CSS file needs to be imported separately. I hope these ui toolkits will help you. I've looked at the same tool kits you mentioned here, plus about 15 more. Built tiny examples with a number of them. Right now I'm using Vuetify, as I was using Polymer + Material before and I though it would give me a good indication of how the environment works and looks. Also, I decided to go with something that has a stronger community behind it, because I want it to be around for a while still. But I must say, there are some good looking toolkits out there and I'm going to try some other ones for bigger projects soon. My suggestion is Buefy. But Buefy's community isn't large like others. So, If you encounter a problem, you may not always find an answer. 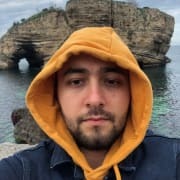 I'll try Vuetify in an example project. Yes, that's the thing. After the Polymer community just disappeared overnight, I'm kind of scared of the same thing happening again. I'll try Buefy. When I tried Bulma, which it is based on, I felt that I wanted complete components, not just css classes, so maybe buefy is perfect. 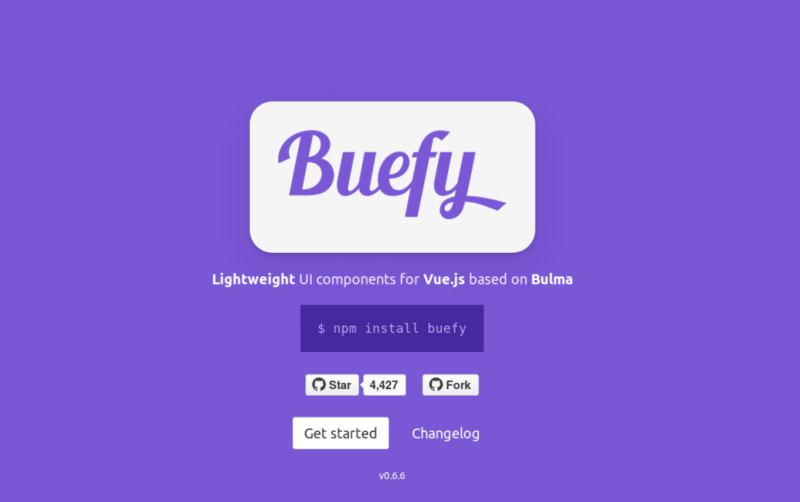 I've used Buefy for a few months (until August 2018) and liked it (Bulma too), the biggest concern I had was that I couldn't include only the components I needed and leave out the rest. Will def check it out now. I remember seeing Material design for the first time long ago, and I thought to myself, "This looks terrible", but I've gotten used to it I think. They inadvertantly broke the color scheme at 0.6.7 - github.com/buefy/buefy/issues/980 - but you might not have noticed if you had it customized (we didn't). Aside from that, they've been pretty solid! Ouch, that is kind of brutal on a minor release. I have our setup completely customized your right so I wouldn't have noticed. I had my own custom built component library built on Bulma at my work but it was getting too difficult to maintain by myself, so I switched to Buefy. So far the team has been very quick to respond to issues and I plan to contribute a ton of accessibility fixes in the near future. I REALLY like Element UI's look, but it's only designed for desktop, which is pretty useless. I really like Quasar. I used today. Maybe I write a review about it. That would be nice, thanks! I use vuetify in a few different applications and can confirm it's pretty great with a fairly response team/community. Can you share your experience with us? For example, what were the good and bad things? I vote Buefy all the way to the top, using it in a large scale Vue / PHP web app and love it. Yes, I agree with you. We used Buefy in our projects. Why isn't Quasar on this list? It's more capable than them all, and more popular than most... seems a real shame not to mention it, and a bit of a shock. I'm planning on using Element but I haven't tried it yet as I'm still working on the API. I'm looking forward to finally reaching the GUI phase. Nice post, I did not know iView and it looks awesome ! Why not? It looks good. Normally, Buefy developed for general purposes. But I created an admin panel with it. Which means you can create other type single page applications with Vuestic. Everything depends on you.